Among German troops, some of the best divisions were comprised of mounted units. Although it may seem odd in the modern day, horses were still used during the Great War to move soldiers into key positions on the battlefield. Given the stalemate of the Western Front, German lancers were more often deployed on the Eastern Front against Russia. The WWI German Cavalry Lancer features artwork based on the M1915 field tunic, M1915 trousers, cavalry boots, Gewehr 98 ammo pouches, leather equipment belt and buckle, leather y-straps, and gas mask bag. It also features a printed gas mask head and BrickArms M1916 Stahlhelm with ventilator lugs textured artwork. 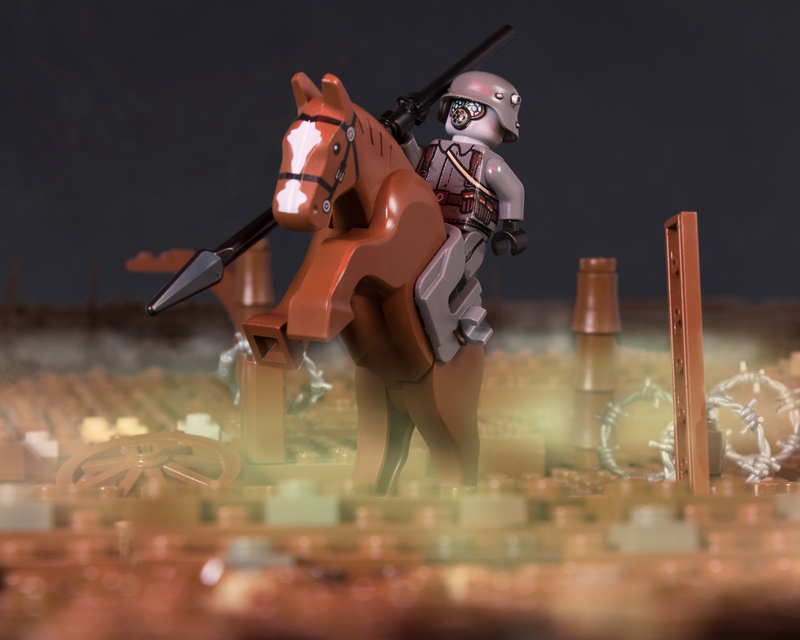 This WWI German Cavalry Lancer features exclusive custom-printed artwork designed by Lando.